I am stuck in a monochromatic palette; mounds of pristine snow and a bleached-out sky offer a pale landscape out my window. The much-appreciated sunshine is bright and clear, but with none of its summertime golden hue. While still beautiful, late winter makes you work just that little bit harder to feel welcomed. Whether it be wardrobe choices (layers are key), weekend plans (more layers) or what to eat (layers of flavour), these last few months of the season seem to require more effort than those preceding. Late fall brings excitement over the return of slow-cooked braises, the opportunity to fill the kitchen with heat and heady smells of herbs and spice. Winter follows with resplendent holiday celebrations, with tables groaning under grand feasts. But now, in the doldrums of early March, the mornings dawn gray and pale. The sun valiantly attempts to stay awake for dinner, but often fails. It is amongst all these pallid hues that we must still attempt to eat our greens. Spring and summertime salads can be made seemingly without thought; all I need are some sparingly-dressed tender young lettuces, or some grilled asparagus or sugar-sweet tomatoes freshly plucked from the garden. Late February and March are a bit more challenging. Hardy winter leaves are often rather unyielding in their assertiveness, and can require equally dominant accompaniments to temper their influence. That is not to say that the effort is unrewarded; milk-coloured Belgian endive, paired with pungent Roquefort and pears is a wonderful balance of bitter, savoury and sweet. Juicy grapefruit segments are the classic counterpoint to aromatic slivers of shaved fennel. Or, as in here, the wild, barely-green curls of sharp frisée compliment salty Parmesan and a honeyed vinaigrette. The lively layers of texture and taste (almost) make one forget the winter lurking just outside the door. Epilogue: I should mention that I started writing this post over the weekend, when we were blanketed under snow and dealing with temperatures in double-digit negative degrees Celsius. Mother Nature was evidently in a benevolent mood, as today the sky is positively robin's egg blue and we have been granted an absolutely balmy 15ºC. The snow has melted, and I even have some windows open. Tomorrow is going to be -4ºC. My own simple creation. Candied nuts can be used instead of the roasted, and pear substituted for the apple. White balsamic vinegar, albeit untraditional, adds an interesting character to this vinaigrette. If unavailable, Champagne vinegar would be my recommended choice. For the vinaigrette; in a small bowl whisk together the mustard, honey and white balsamic until combined. Whisking constantly, slowly add the olive oil until the vinaigrette becomes emulsified and thick. Season to taste with salt and pepper. Set aside. 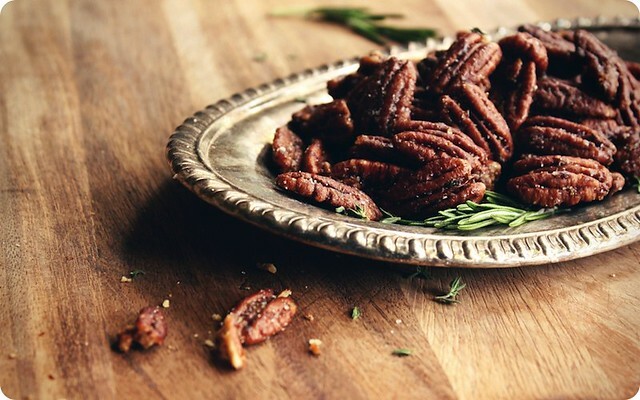 In a dry skillet over medium heat, lightly toast the nuts until fragrant. Remove from pan, set aside. 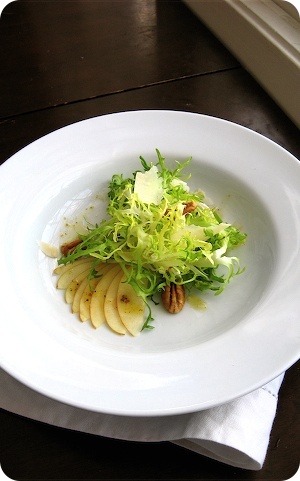 In a bowl, toss together the frisée, apple and nuts. Pour over about half of the vinaigrette and toss gently. Check for seasoning. Divide the salad between two serving plates, garnish with Parmesan shavings. Drizzle additional vinaigrette over the plates, reserving some to be served alongside if desired.